Marcel Breuer was a modernist architect and furniture designer in the 1900s. He was known as one of the masters of Modernism, and he was a student and teacher at the Bauhaus school of design. In his early years, Breuer was head of the school's carpentry workshop. He eventually went on to design commercial areas as well as houses in Berlin. In the 1930s, Breuer was employed by Isokon, taking time to design various pieces of furniture using plywood. Later on, he would end up in the U.S., teaching at Harvard's school of architecture, and working with many architects who would later on become well-known. While at Harvard, Breuer also took the time to work with his old colleague from Bauhaus, Walter Gropius, on many buildings in the Boston area. 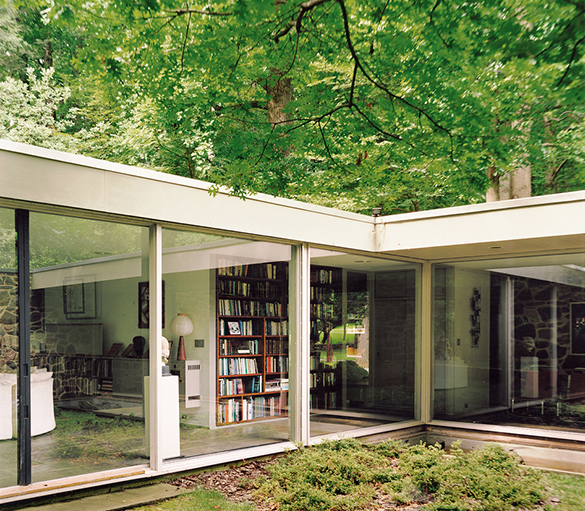 One example of his work with Gropius is the Alan I W Frank House, located in Pittsburgh. In 1941, Breuer ceased his partnership with Gropius and established a firm in New York. During this time he put forward many new concepts that are used in popular modernist style. In 1947, he begins to experiment with houses in New Canaan, building himself a home (Breuer House I) in 1947-48. He later built Breuer House II, also in New Canaan, between 1951-52. During 1963-64, Breuer begins working on the Whitney Museum of American Art, which is one of his best-known projects. He also developed the Grand Central Tower in New York, which led to his reputation becoming tarnished due to his being blamed for the unpopular MetLife Building, which was actually designed by Emery Roth & Sons, Walter Gropius, and Pietro Belluschi. From 1969-71, Breuer was commissioned for the design of the Cleveland Trust Tower. The Tower was originally planned to be one of a set of two towers, but the second tower was never created due to plans at Cleveland Trust. The Tower has been vacant since 1992, and was purchased by Cuyahoga County commissioners in 2005 for $22 million, with plans in mind to demolish the tower and use the site for a new county administration center. Many preservation groups strongly opposed its demolition, and as a result the Tower was sold to the K&D Group as part of a $133 million hotel/condo complex. Hooper House II was commissioned by Edith Hooper and designed by Breuer and architect Herbert Beckhard from 1958-60. The house provides a clear view using plate glass as well as noise management using stone walls.